Genetically engineered (GE) crops owe their unique properties (e.g., disease resistance, insect resistance, herbicide tolerance) to DNA and genes that have been transferred across reproductive boundaries from seemingly unrelated organisms. The transferred genetic material functions in the new host because it is a set of molecular instructions, a recipe written in the same language as the rest of the plant’s DNA. This common language of DNA reflects the unity of life. In 1953 James Watson and Francis Crick figured out the structure of the DNA molecule, which carries the hereditary genetic information of all living organisms (some viruses use RNA instead). Barely a decade later scientists determined how the DNA is translated to proteins. They found that the four nucleotide bases* of DNA combine in groups of three (called a codon) to code for the 20 amino acids used in subsequent protein synthesis. The genetic code was found to be the same in all living organisms. Along with the standard model of particle physics and the periodic table of the elements in chemistry, deciphering the genetic code is one of our most remarkable and important scientific achievements, giving us a greatly improved understanding of how the world around us works. An abundance of scientific evidence leads to the conclusion that all life on earth is related and shares a common ancestry (1). And the reason that DNA and genes can be successfully transferred across species, genera or even different kingdoms of life is that DNA is common to all forms of life and the genetic code is universal (1, 2). 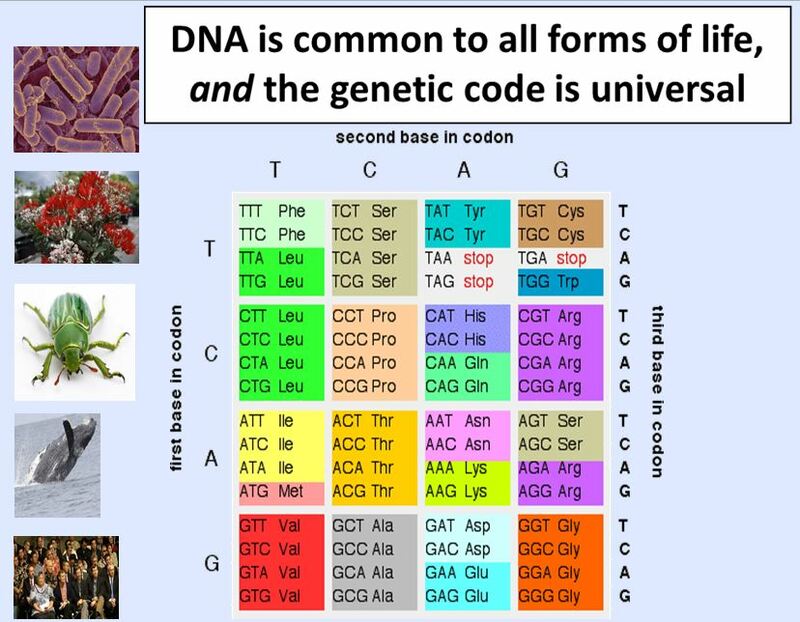 The codon CAG on a strand of DNA is the genetic code for the amino acid glutamine; this sequence codes for the placement of glutamine in protein synthesis whether it occurs in a microbe, a plant, an insect, an aquatic mammal or a member of the Hawaii state legislature. And the same applies for whole genes – they can function in a recipient organism the same as they do in the donor organism. The first product of genetic engineering to be approved by the Food and Drug Administration was insulin in 1982. The human gene for insulin was inserted into a bacterium which allowed the production of human insulin under controlled conditions in fermentation tanks. Prior to this innovation, insulin was obtained from pancreas extractions mostly from pigs or cattle obtained from the slaughterhouse. Bacteria of course do not produce or use insulin, but when the human gene for insulin is properly inserted into their DNA, they dutifully read the recipe and make insulin which is recovered and processed. It is referred to as a recombinant DNA drug product, meaning that the DNA was obtained from one source and recombined in another. Today, recombinant insulin accounts for almost all the insulin on the market. 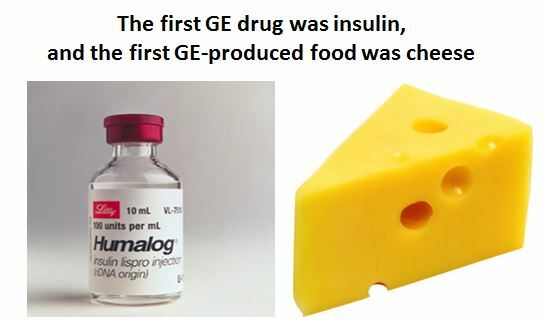 The first application of genetic engineering to foods was with cheese. The rennet enzymes used to coagulate milk in making cheese traditionally were obtained from stomach of calves, with the slaughterhouse being the primary source. The key enzyme of rennet is chymosin, and it was isolated and inserted into yeast through recombinant DNA methodology and approved for use by the FDA in 1990. Most of the hard cheeses are now made using chymosin from GE yeast. GE products are commonplace today. Following the success of recombinant insulin, a vast array of drugs have been developed using recombinant DNA technology including treatments for anemia, hepatitis B and C, multiple sclerosis, cancers, cystic fibrosis, osteoporosis, melanoma, non-Hodgkin’s lymphoma, and human papilloma virus. GloFish with inserted fluorescence genes from jellyfish were originally developed to detect environmental pollutants, and are now available as aquarium fish. In open field releases, Oxitec’s GE mosquitoes have crashed mosquito populations carrying Dengue fever viruses, and one of the vaccines against the Ebola virus is being produced in GE tobacco. The information in DNA and genes can be widely shared among organisms, and application of recombinant DNA techniques allows us to use traits from all life forms in meeting the important challenges we face in the 21st century. The applications are emerging at a rapid pace and they continue to have great potential for making our lives better and the world a better place. * The four nucleotide bases of DNA are Adenine (A), Cytosine (C), Guanine (G) and Thymine (T). ** The amino acids are alanine-ala, arginine-arg, asparagine-asn, aspartic acid-asp, cysteine-cys, glutamine-gln, glutamic acid-glu, glycine-gly, histidine-his, isoleucine-ile, leucine-leu, lysine-lys, methionine-met, phenylalanine-phe, proline-pro, serine-ser, threonine-thr, tryptophan-trp, tyrosine-tyr, and valine-val. (1) F. Ayala. 2009. Molecular Evolution. In M. Ruse and J. Travis, eds., Evolution: The First Four Billion Years, 132-151. Cambridge: Belknap Press. (2) DNA from the Beginning. Cold Spring Harbor Laboratory. J.D. Watson and A. Berry. 2006. DNA: The Secret of Life. New York: Alfred A Knopf. National Academy of Sciences and Institute of Medicine. 2008. Science, Evolution and Creationism. Washington, D.C.: The National Academies Press. ← Where Do All the GMOs Go?